Psychology Says Couples Who Argue Actually Love Each Other More. It probably seems a little counter intuitive to say that couples who argue are actually part of more successful relationships, but new research from scientists tells us it’s true. Respected psychiatrist Dr. Gail Saltz explains that “Arguing can be a very rewarding experience between two people as they express their different points of view, their feelings, and their individualism”. While it’s normal to go through that famous honeymoon phase where fighting is pretty much unheard of, as soon as we get comfortable around each other our flaws come out of the woodwork and we begin to find ourselves in need of compromises and understanding. It is essential to be able to discern when an argument has devolved and is no longer doing anyone any good. If you and your partner find that you simply feel enraged rather than relieved at the expression of your frustrations, it may be time to walk away and take a break. The arguing is only helpful as long as you are both capable of communicating, even if is a little angry or impatient. When you’ve reached the point where you are too emotional or upset to communicate your point or to listen to the point being made by your partner, this is a sign to stop discussion and calm yourself. You should keep in mind at all times during a conflict that this is a person you love, regardless of whether you’re angry with them in the moment. Never let that anger overwhelm the love you feel, and your arguments can never be truly destructive. A verbal disagreement can actually be a great opportunity for us to learn about ourselves and our partner. We find out what they want or which needs they have that aren’t being met and we can communicate the same information back to them. It’s important that you look at each disagreement as an opportunity for growth and not some unpleasant chore. 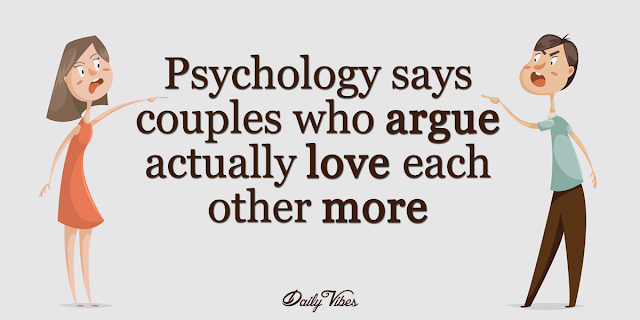 When two people argue, it can seem like a negative, but if you go into an argument with the right mindset and love for your partner despite your frustrations, there is a lot of benefit to be reaped. Be patient and stay calm, keep an open mind and try to listen and each argument can be a strengthening brace for the foundation of your relationship.